Item description: Portions of Leaves from a Diary Written While Serving in Co. E, 44 Mass., Dep’t of No. Carolina, an account, written by John Jasper Wyeth of Co. E, of the experiences of the 44th Massachusetts Infantry Regiment (published in 1878). 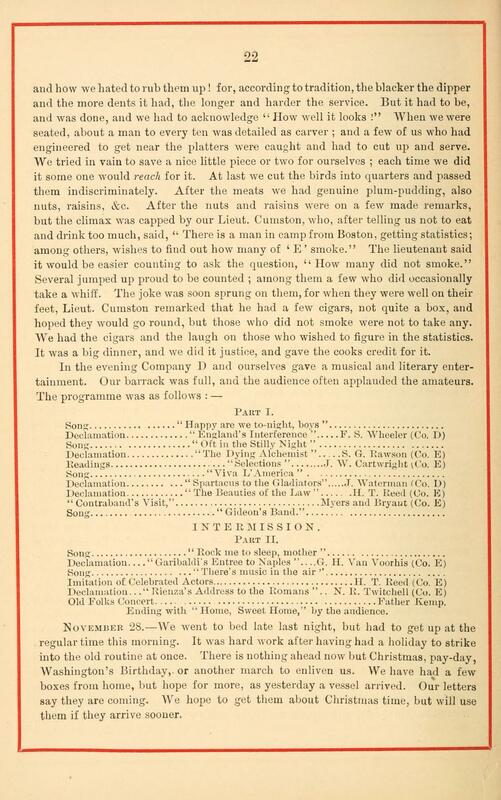 The book includes this account of the regiment’s 27 November 1862 Thanksgiving celebration. Item citation: From, “Leaves from a diary written while serving in Co. E, 44 Mass., Dep’t of No. Carolina, from September, 1862, to June, 1863.” by John Jasper Wyeth, Boston, L. F. Lawrence & Co., 1878. Catalog Number: C970.742 W97, North Carolina Collection, University of North Carolina at Chapel Hill. great pity, but unable to relieve them. some of the officers taking hold and seemingly enjoying the sport. engineered to get near the platters were caught and had to cut up and serve. hoped they would go round, but those who did not smoke were not to take any. We had the cigars and the laugh on those who wished to figure in the statistics. It was a big dinner, and we did it justice, and gave the cooks credit for it. tainment. Our barrack was full, and the audience often applauded the amateurs. Old Folks Concert … Father Kemp. Ending with “Home, Sweet Home,” by the audience. 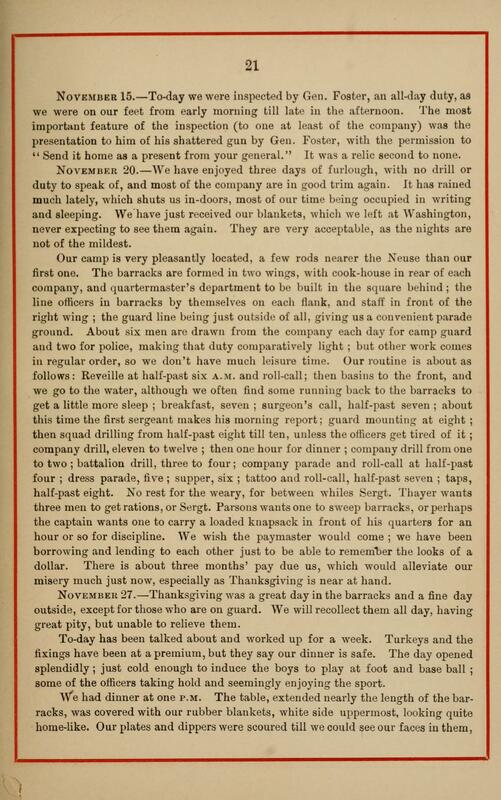 This entry was posted in Southern Historical Collection and tagged 44th Massachusetts Infantry Regiment, entertainment, John Jasper Wyeth, Massachusetts, North Carolina, published diaries, Thanksgiving. Bookmark the permalink.